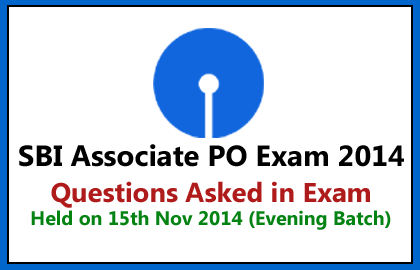 List of questions that asked in SBI Associate PO Exam 2014 dated 15/11/2014(Evening Batch). Candidates those who are preparing for the IBPS PO/Clerk and all other banking exams can make use of it. Mutual Funds are regulated by? How many digits are there in MICR? Who has been appointed as the new Economic Affairs Secretary? What is the maximum maturity of deposit of Commercial Paper? What is the full form of IFSC? Which of the following channel has got the rights to telecast the Tennis League? What is the function of Ctrl + Delete? What is the name of the account that SBI has launched for minor children above 10 years? Who is the winner of Men Booker Award for the year 2014? Which key is used to reach the end of the line in Word? Who is the author of the book”Roger Federer: Quest for Perfection”?